UPDATE: In their report, police said that fires had been set in the apartment living room and on a mattress in the rear bedroom. The victim told police that approximately $500 was missing from her home. Officers said Hill had $472 in his possession at the time of his arrest. The case is classified as domestic-related. 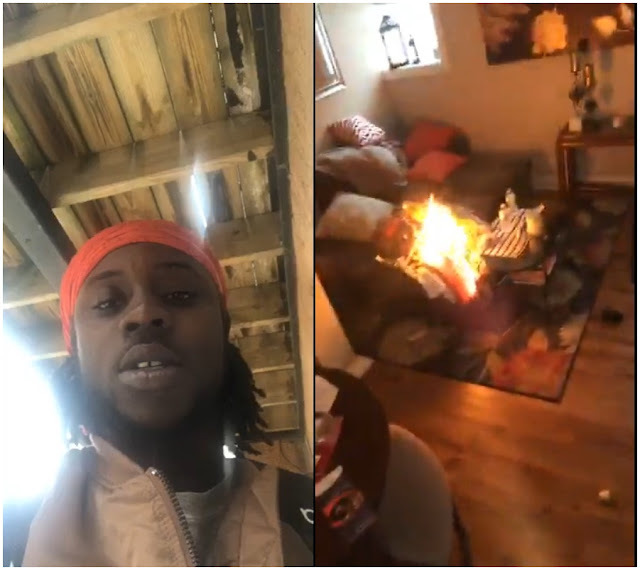 A Lakeview man is facing attempted arson charges after he allegedly set a woman’s apartment on fire and then posted the video to Facebook Live. Police and fire personnel were called to the woman’s apartment in the 1000 block of West Dakin around noontime Saturday after a man reported an apartment fire. Moments later, the woman who rents the unit called the Town Hall Police District desk to report that she was watching her apartment burn via video. Sharrod Hill, 21, who lives on the same block as the victim was taken into custody by arriving officers. Police did not detail the kind of relationship that exists between Hill and the victim, if any. “Everyone, I want you guys to see this,” Hill says as the 17-second Facebook Live video begins. The fire caused limited damage to the residence, which is located near the Sheridan Red Line station. Prosecutors charged Hill with one felony count of attempted arson. He was ordered held without bail. Hill last year received probation for an incident at Northern Illinois University in which a woman alleged that he chased, choked, and groped her in a domestic incident on campus.